Abu Dhabi, May 25th 2017 – Finance House Securities (FHS) was awarded a Certificate of Appreciation by the UAE Securities and Commodities Authority (SCA) during the 7th Awarding Ceremony of the Brokers Licensing Qualifications Program for year 2016 – 2017. FHS has been awarded for being among the first 10 companies to complete the SCA Continuous Professional Development Program (CPD) in 2016 and in recognition for its significant and pioneering contribution towards the program. 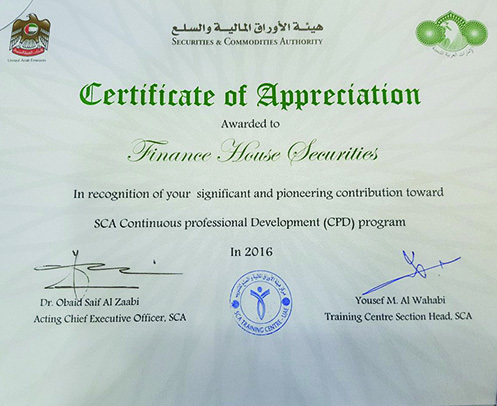 Ayman Al Khatib, General Manager of Finance House Securities, said: “It is an honor to be the recipient of the SCA Certificate of Appreciation. We believe that professionalism is a key success factor in today's competitive market and to guarantee our customers dealing with professionals, we spare no effort to continually develop and strengthen our employees’ capabilities”. The CPD program required that all licensed persons who are working in a financial institution which is regulated by the SCA and registered with a profession licensed to complete a minimum of 30 CPD hours in learning and training activities every year. “Being a local brokerage company, we are committed to support the SCA’s determined strategy to improve the UAE financial market and we will continue training our financial professionals to provide highly secure and efficient brokerage services that service UAE investors.